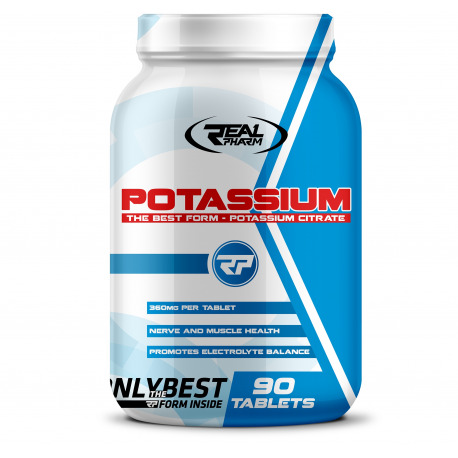 Excellent formulation based on very well-assimilable chemical form of potassium! One of the most important minerals that you can not miss in your diet. He participates in physiological processes, is responsible for the correct course of muscle contraction, but also plays a key role in neurotransmission! Real Pharm Potassium is a very good source of potassium, which plays a number of roles in the human body. Supports the proper functioning of the nervous system, is involved in metabolic changes and determines the proper functioning of the muscles. It is worth remembering that its proper amount in the diet determines maintaining the acid-base balance of the person (this is directly related to the optimal PH of the body). Real Pharm Potassium is distinguished by very good assimilation due to its chemical form (potassium citrate). Each serving provides a solid dose of active ingredient. The product is aimed at professionals and amateurs alike and can effectively complement its possible deficiencies. REAL PHARM POTASSIUM - DO NOT LEAVE YOU FORWARD! 1 tablet 2 times a day. Do not exceed a maximum of 2 servings (2 tablets) per day. Ingredients: potassium citrate, filler: microcrystalline cellulose, anti-caking agent: magnesium salts of stearic acid, anti-caking agent: silicon dioxide.